Experience three days of food and fun at the eighth annual Pacific Sales Kitchen & Home’s Palm Desert Food & Wine, happening from March 23–March 25, 2018 at the Gardens on El Paseo. Regarded as one of Greater Palm Springs’ top foodie events for its impressive offerings and libations, Palm Desert Food & Wine is set to offer some of the best and most diverse flavors yet. Here’s what’s cooking at this year’s event. 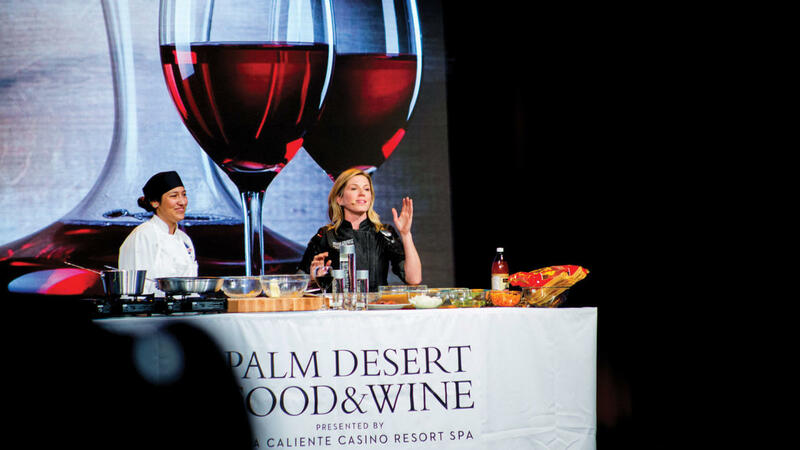 Presented by Agua Caliente Casino Resort Spa Rancho Mirage and organized by Palm Springs Life, Palm Desert Food & Wine is a renowned culinary event that features a standout roster of celebrity chef demonstrations, plus a number of leading breweries, wineries and restaurants. The adults-only events (21+, please) bringing together some of the best people in the food industry for a weekend of good eats, fine wine and craft beer tastings. It all takes place from Friday, March 23 through Sunday, March 25, 2018, with each day bringing new events and savory food and drink options. Timeframes for scheduled events vary each day. The El Paseo Shopping District in Palm Desert hosts Grand Tastings on the west side of the upper level parking deck of the Gardens. Other event festivities take place across different locations in Palm Desert. Highly acclaimed chefs from around the country come to the Coachella Valley for this yearly event to provide culinary excitement, cookbook signings and incredible moments as they teach you tricks of the trade during live cooking demos and gatherings. Seating for chef demonstrations are first come, first serve, so plan to get there early. Not only to attendees get to engage with these distinguished culinary artists, but as an added bonus, you get to taste the foods being prepared during the presentations, too. To see this year’s exclusive event talent, check out the chef line-up. Attend fabulous festival pre-events like An American Kitchen with an Indian Soul at Toscana Country Club. Featuring Aarti Sequeira and Eric Wadlund, Executive Chef at Toscana Country Club, this chef experience focuses on the vibrant, culinary landscape of India and provides an opportunity to spend time with these two in the kitchen. Assist them as they prepare a remarkable Indian-inspired four-course meal for guests to enjoy later in the evening. Or learn something new during “Cheese” with Laura Werlin. Happening at On The Mark Cheese Shop in Palm Springs at 6 p.m., this seminar discusses the art of pairing cheese with wine and cheese with cheese! Also on the menu for Thursday is Savory Spice presents Gale Gand’s Vanilla 101. Beginning at 6:30 p.m. at Savory Spice in Palm Desert, join Chef Gale Gand as she explains everything you need to know about vanilla. Kick off the official start of Palm Desert Food & Wine by purchasing tickets to the James Beard Gourmet Four-Course Luncheon. 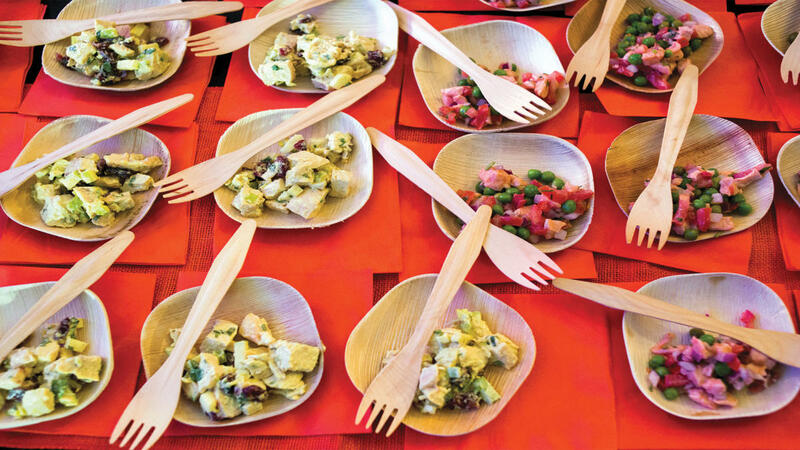 Hosted by food writer and TV personality Gail Simmons of Top Chef, the ever-popular luncheon is created by James Beard award-winning and nominated chefs and is accompanied by premium wine pairings. The event is well attended and is a special feature of Palm Desert Food & Wine that seems to get better and better each year. Nourish your palate and satisfy your appetite at the Palm Desert Food & Wine Grand Tastings on Saturday and Sunday. Grand tastings happen every year, with special chef presentations also taking place. On Saturday, listen to Pastry Chef Zac Young’s Cakery discussion with Premier Grand Tasting tickets. This will include early entrance to the event, special tastings and an exclusive celebrity chef demonstration by Young at 10 a.m., where you’ll learn about creating Instagram-worthy cakes from scratch. On Sunday, join renowned chocolatier, Chef Valerie Gordon, for Chocolate Decadence & Champagne. 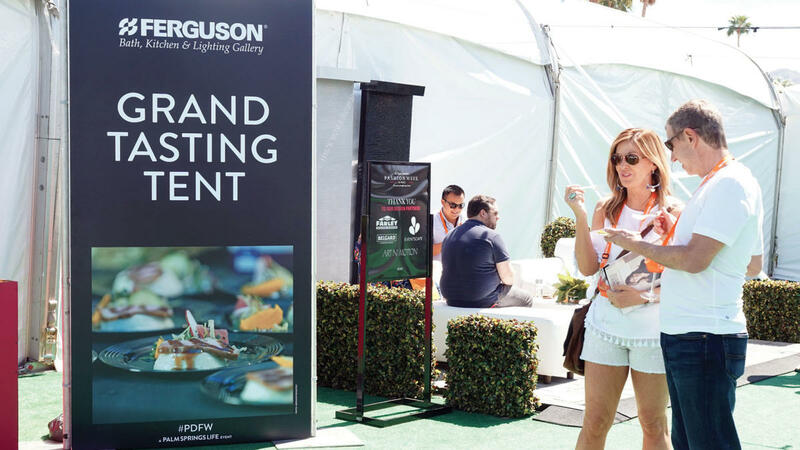 A Premier Grand Tasting ticket is required for this event, which also includes early festival entrance, special tastings and an exclusive celebrity chef demonstration by Gordon at 10 a.m. Sugary surprises await you during this demo that features decadent chocolate treats. More than 40 local restaurants will be in attendance during the two-day Grand Tastings. 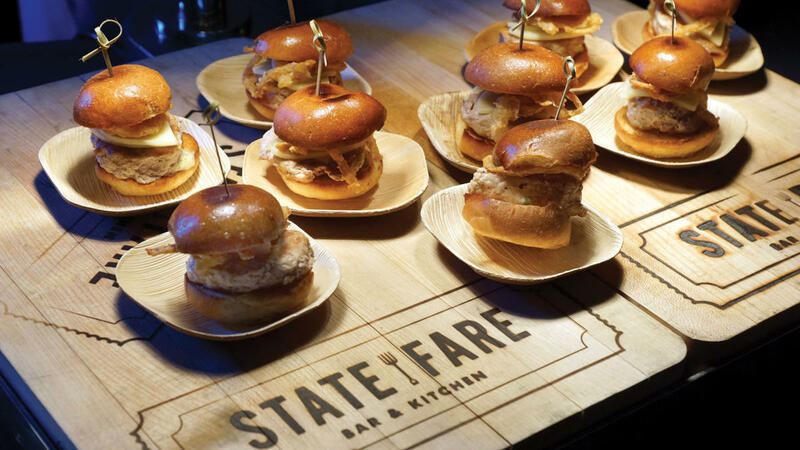 Guests have the opportunity to sample unlimited tasty bites prepared by talented cooks and chefs. The Grand Tastings lineup will also feature a wide selection of drinks from local and regional craft breweries, master distillers and vintners that you do not want to miss. Grand Tastings attendees will also feature culinary-focused vendors offering top-of-the-line, unique and cutting-edge products for your kitchen. This year, Palm Desert Food & Wine will benefit both the James Beard Foundation and Coachella Valley FIND Food Bank, a nonprofit organization that provides food to those in need. As a proud supporter of FIND Food Bank, Palm Desert Food & Wine will donate 35 meals to the organization for every festival ticket purchased. The festival offers both reserved and general admission passes. Guests can purchase tickets online, as well as at the event ticket booth at the Gardens. Attendees can get tickets for individual events or purchase all-inclusive packages, which offer sweet deals on multiple experiences. Tickets cover all food and beverages consumed at the event. Visitors can also take advantage of tickets and hotel packages. Want to explore more food and drink options in the oasis? Discover restaurants in Greater Palm Springs for must-try local flavors at distinguished dining establishments in the region.